Listen to Jim's interview at Under the Crossbones. With a longship of his own, Thorgrim Night Wolf finally sets sail for Norway with Harald, his son, and Ornolf, his father-in-law. But the Norse sail at the whims of the gods, and the vessel collides with a log. Forced to put into shore, but determined not to return to Dubh-linn, Thorgrim and his men land in Vík-Ló, a Danish longphort on the eastern coast of Ireland. After the Danes grudgingly allow them to make repairs, Thorgrim – much to his regret – soon finds himself entangled in the struggle between the Irish and the Danes. Lord of Vík-Ló Grimarr Giant needs to find the plundered treasure that his trusted friend buried before being attacked by Lorcan, an Irish leader who wishes to rid Ireland of all Norsemen. Only one person – a slave girl – survived the attack, and no one among the Danes can communicate in the Irish tongue. Harald can so Grimarr enlists his help as a translator. Grimarr also needs Thorgrim’s assistance in recovering the treasure, but the struggle between the Danes and these Irish are not Thorgrim’s affair and he declines the request. Making an end run around him, Grimarr sends a man to spread the word of the treasure quest. This news excites the Norse, especially when told they will share in the wealth. Without these men Thorgrim won’t be able to sail home, so he acquiesces to Grimarr’s request. This manipulation is but the first trick up Grimarr’s sleeve, and as the days pass it becomes harder to tell who is friend and who is foe. Lorcan thirsts for power and with his overlord absent, he is determined to wrest control of the area. To that end he has three goals: gain the treasure for himself, steal or destroy a Viking longship, and destroy the longphort and its inhabitants so no more Northmen will ever dare to set foot there again. His spies in and around Vík-Ló keep him apprised of the goings-on there, and with the help of a turncoat among Grimarr’s men, Lorcan sets his plans in motion. The only thorns in gaining all he desires are Thorgrim Night Wolf and Starri the beserker. The third book in The Norsemen Saga, The Lord of Vík-Ló is an intricately woven web of intrigue and betrayal. The occasional missing or misspelled word may distract some readers, but only momentarily. 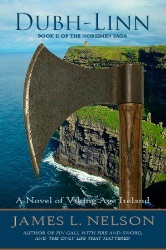 Action abounds and much of it takes place in and around the water, where readers are treated to battles between Viking ships and Irish currachs. 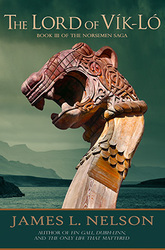 The characters bring to life Norse lore and tradition, including their traditional boat burials. The story starts off slow – although not so the action – but once Thorgrim and his men enter the tale, the pace picks up and builds until a single crack unleashes an avalanche of cause and effect until the reader dare not put down the book.